JON SCOTT (CO-HOST): Mitch McConnell right now has five senators, his Republican senators in opposition. He can only lose two of them and still get this thing passed. So does he get it passed? CRAIG MELVIN (HOST): Plans set to rise by an average of 25 percent in the 39 states served by Healthcare.gov. MSNBC’s Ali Velshi is here to break down these numbers to help separate some fact from fiction, if you will. What can you tell us? ALI VELSHI: Well, you're going to hear a lot of different, specific numbers, so I want to give you a narrative, a sort of a sense of what’s going on. In 2017, they are expecting that 13.8 million Americans in total will be enrolled in America. This is not the number of people insured, obviously, because many people are insured through their work. This is the number of people insured through Obamacare. It’s a little increase over 2016. The silver plan, which is the benchmark plan they use -- there’s gold, silver, platinum, bronze, and other plans -- is going to be up an average of 22 percent. With a number you used, 25 percent, that's across 39 states. This will be the whole average, about 22 percent. And that will bring the premiums up to about $3,552 a year. MELVIN: That doesn't include subsidies, correct? Health insurers across the country are making plans to dramatically raise Obamacare premiums or exit marketplaces amid growing exasperation with the Trump administration’s erratic management of the program and its conflicting signals about the fate of aid for low-income consumers and other key issues. The revised bill attempts to solve that problem by imposing a penalty on those who don't maintain continuous insurance coverage: People who let their coverage lapse for at least 63 days in one year would be locked out of the insurance market for six months the following year. The change comes as congressional forecasters are trying to predict how the Senate bill would affect insurance costs and coverage. The nonpartisan Congressional Budget Office expects the change would slightly increase the number of people buying insurance in the individual market. Research Assistant for Domestic Policy Studies at the Heritage Foundation, Jean Morrow, spoke with Breitbart News Daily SiriusXM host Alex Marlow on Friday regarding the newly released Senate Healthcare Reform Bill. “It falls short on repealing Obamacare,” said Morrow, going on to address some things the bill does include. “Our healthcare plan will lower premiums & deductibles — and be great healthcare!” [Trump] tweeted last month. A few days earlier he tweeted that Republicans would provide “much lower premiums & deductibles.” In March, he complained that “deductibles are so high you don’t even get to use [insurance]" under Obamacare. But the Senate bill released last week and the House bill passed last month take the opposite approach: They include policies that encourage higher deductibles and dramatically raise out-of-pocket costs, in some cases by thousands of dollars per person. The president has embraced both efforts even though they violate his repeated promises. It’s not hard to understand why deductibles would go up under the two Republican plans. There are two major provisions in the Senate bill, for example, that specifically affect deductibles and expenses. First, the Senate bill encourages customers to sign up for plans with higher deductibles. Under Obamacare, the amount of subsidies customers receive to buy coverage are pegged to the price a “silver” plan, which covers about 70 percent of the average user’s medical costs. The average deductibles for these plans right now are about $3,500 for individuals and $7,500 for families, according to an analysis by the consumer site HealthPocket. But the Senate bill instead pegs its subsidies to insurance plans that cover only 58 percent of costs. Similar plans on the marketplace this year have average deductibles of more than $6,000 for individuals and $12,000 for families. That means customers face an increase of thousands of dollars in deductibles unless they pay more in premiums. That's not the only provision that hikes deductibles, though. Both the House and Senate bills eliminate subsidies that were created just to lower deductibles for low-income customers. Under Obamacare, insurers cover a large portion of out-of-pocket costs for individuals making up to 250 percent of the federal poverty level — about $30,000 for an individual and $61,000 for a family of four. In exchange, the federal government reimburses them for the difference. The theory is that customers in this income range would otherwise struggle to benefit from a silver plan with deductibles of $7,500. But the House and Senate bills each eliminate these cost-sharing provisions — and the effects would be dramatic, according to a Kaiser Family Foundation analysis. If you’re an individual making around $18,000 a year, your effective deductible would be about $255 under Obamacare. Under the Senate bill, though, that number would jump to over $6,000 — almost 24 times higher. The Senate bill also eliminates Obamacare’s Medicaid expansion and reduces the program’s overall growth over time, meaning millions of people currently paying little in out-of-pocket expenses through the government program would be expected to purchase high-deductible private plans instead. There are currently over 11 million people who qualify for Medicaid and have signed up thanks to the expansion, which covers individuals who make up to about $16,000 a year. STEVE DOOCY (HOST): And the final question, real quick, please: Insurance companies are required to accept all applicants regardless of pre-existing conditions? DR. NICOLE SAPHIER: Oh, notorious pre-existing conditions, which may be the weakest link in the bill, to be honest, but it still remains. Pre-existing conditions will be covered under the Senate health care bill. DOOCY: Despite what you might hear on TV. SAPHIER: Despite what you might hear. Under the ACA, a.k.a. Obamacare, insurers are required to sell a comprehensive insurance policy to anyone who wants it, and their premiums have to be based on the expected needs of an entire community, not each individual applicant. Those three elements — “guaranteed issue,” mandatory coverage of “essential health benefits” and “community rating,” in the parlance of the insurance industry — are collectively the shield that protects people with preexisting conditions who aren’t covered by a large employer’s insurance plan. The Senate’s “Better Care Reconciliation Act” wouldn’t repeal that part of the ACA — Senate rules don’t allow that sort of legislating on a budget reconciliation bill. But it does include a provision giving states carte blanche to waive the essential health benefits, as long as they don’t increase the federal deficit. So, under the Senate bill, it would be perfectly fine for a state to let insurers offer cheap policies that exclude coverage for potentially costly risks and preexisting conditions (for example, by omitting maternity care and cancer drugs) as well as extremely expensive comprehensive policies that any resident can access — but not necessarily afford. Or a state could offer the comprehensive policies itself through a high-risk pool, an approach that’s been tried and failed repeatedly because of its high costs. Either way, average premiums would drop, which the state could argue would be expected to boost enrollment. As they argue for the bill, Republicans are going to claim that it will not allow insurance plans to discriminate against people because they have a pre-existing condition. But that just isn’t the case. The Republican plan may not allow insurers to discriminate against a pre-existing condition through the front door, but they’ve created a backdoor way in. So what is this backdoor for discriminating against those with pre-existing conditions and how does it work? Answering that question requires understanding the importance of a key protection in the Affordable Care Act, what is known as the “Essential Health Benefits” requirement. These Essential Health Benefits rules require insurance companies to cover critical care, such as treatment by doctors, hospital stays, and prescription-drug costs. The guarantee of Essential Health Benefits means that no insurer can provide any health plan that excludes these critical benefits. Perhaps it goes without saying, but if these benefits are not covered, a plan is all but worthless to those with serious pre-existing conditions. The Affordable Care Act does allow, through Section 1332, for states to have some flexibility to waive these and other requirements, but only if they meet very rigorous conditions or “guardrails” that ensure coverage remains available, affordable, and high-quality. 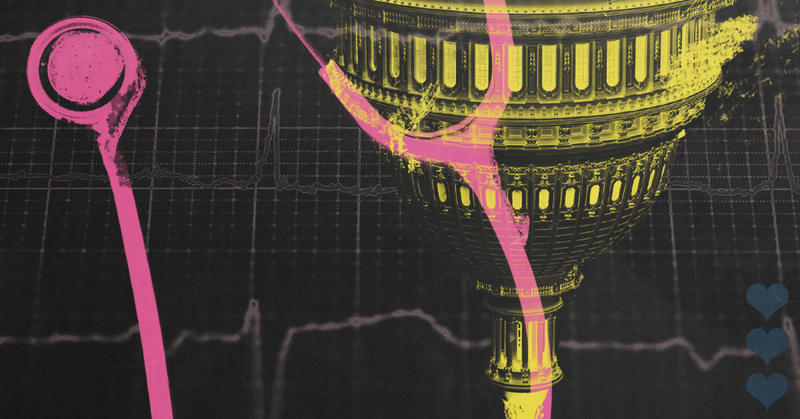 This is where the new Senate bill makes significant—and dangerous—changes. The bill drives straight through these carefully crafted guardrails. Today, to waive requirements like essential benefits, a state must show that the alternative insurance being provided is “comprehensive,” and “will provide coverage and cost-sharing protections against excessive out-of-pocket spending.” These careful conditions on quality are removed in the Senate bill, replaced with a bare-minimum requirement that the alternative doesn’t increase the federal budget deficit. States will be able to easily waive the requirement to cover Essential Health Benefits, without any careful conditions to ensure the quality and affordability of coverage. The state may not explicitly say they are making those with pre-existing conditions pay more, but that will be the impact. Many of those families will simply not be able to afford the care they need. And it could get worse. A thoughtful analysis by Matt Fiedler at the Brookings Institution found that where states can waive Essential Health Benefits, insurance companies and employers could reinstate annual and lifetime limits on coverage. AINSLEY EARHARDT (CO-HOST): You have Senator [Susan] Collins [(R-ME)\ who’s saying, “I want to see the CBO report,” but didn’t the CBO report say that Obamacare was going to do well and be successful? Wasn’t it wrong? Still, experts said CBO’s forecasts were reasonable at the time. "With respect to precise quantitative point estimates, the differences between CBO's estimates and actual experience are well within the range that I would expect given the scope of the change CBO was being asked to analyze," said Matthew Fiedler, a fellow with the Center for Health Policy in Brookings' Economic Studies Program. Fiedler also noted that CBO's "big picture" assessment of the impact of the ACA on insurance coverage was on point. Specifically, the agency estimated a significant decrease in the number of people without health insurance that would leave the uninsured rate at a historic low, which is what occurred, he said. Even before the Congressional Budget Office released its cost estimates in March on the House proposal to overhaul Obamacare, the Trump administration and GOP lawmakers were trying to discredit the much-anticipated report, or CBO score, as it’s familiarly called. “Really been meaningless,” said Gary Cohn, Trump’s top economic advisor. “Consistently inconsistent,” added Sen. Tim Scott (R-S.C.). “A red herring,” chimed Rep. Larry Bucshon (R-Ind.). Never mind that the CBO works for Congress and that its director, Keith Hall, was appointed by their own party leaders in the House and Senate in 2015. Although there’s no comprehensive measure on the hundreds of cost estimates on bills it does every year, the CBO’s analyses and forecasting are regarded as good or better than others doing similar work. JULIE ROVNER: Of course, the other big piece of this bill that has nothing to do with the Affordable Care Act is a capping of federal funding for the Medicaid program, which is something that Republicans have been trying to do since Ronald Reagan was president. MICHEL MARTIN (HOST): This is also a longtime goal, mainly Republicans but also some Democrats, to kind of rein in this very significant entitlement program. How would it work under this Senate bill? ROVNER: It's somewhat similar to the House bill, although the cuts would go even deeper. At some point, over a period of years, the federal government would basically limit what it pays for Medicaid, which has always been a shared program between the states and the federal government. It covers whatever people are eligible - for basically whatever they need medically. And the federal government says yeah, states, we're going to pay this much and no more. And that amount is going to go up every year slightly, but in the Senate bill would be based on just regular inflation, whereas medical inflation has always been faster. So it would basically erode the ability of states to pay for their Medicaid programs. MARTIN: How would this work at the state level? Essentially the state governments become the primary decision makers on who gets Medicaid now as opposed to having it be available to everybody who meet certain criteria? KING: Now, does that pass the fact check? CNN Money's Tami Luhby joins us to separate the spin from the substance. Tami, you just heard Kellyanne Conway. She says if you’re in Medicaid now, you can keep your Medicaid. Is there such an ironclad clause? KING: So walk us through those numbers, then, or "slower growth," as Kellyanne Conway says. Conservatives say it’s all about giving flexibility to the states. Does that work? LUHBY: Well let me read you what the National Association of Medicaid Directors board said about the Senate bill today. “No amount of administrative or regulatory flexibility can compensate for the federal spending reductions that would occur as a result of this bill.” So yes, states would get more flexibility, but they’d get a lot less money, too. 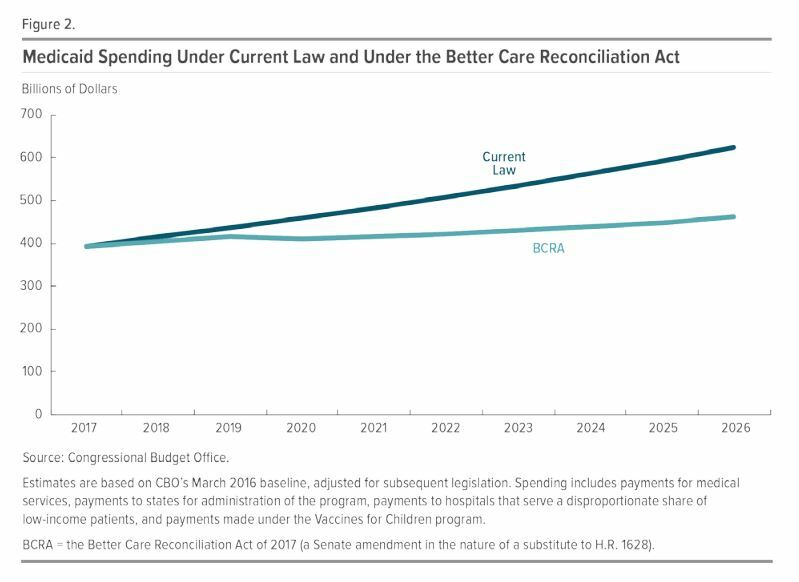 The CBO says the House bill would mean an $834 billion cut over the next 10 years compared with current law. That's a 24 percent decrease. We're waiting for the CBO score of the Senate bill later today. But look, many of these states are cash-strapped as it is. So they would likely have to tighten up eligibility, reduce benefits, or cut payments to doctors and hospitals just to deal with these cuts from D.C.
MARY KISSEL: Let's talk about who Medicaid was originally supposed to help. It was supposed to help the poor, it was supposed to help children, handicapped people, people who really needed the help. What Obamacare did is it simply said, "Let's just expand this program to people who don't need it." That was actually the bulk of Obamacare. Now, you've had some states, Indiana and Rhode Island being a couple of examples, where it hasn't been an open-ended entitlement. The governor said, "Just give us the money and let us construct the program to help the people in our states." That's what Republicans are trying to do while also lifting the restraints on insurers to get more competition in there and to offer, for instance, catastrophic policies. For those who say, "Look, somebody's going to go uncovered in America," that's never been true. JULIE BANDERAS (HOST): This is America. We wouldn't allow that to happen. KISSEL: This is America, you wouldn't. But we're trying to give more people more options. BANDERAS: The message of "people are going to die." I mean, that is beyond the worst message. That is a scare tactic. GREG GUTFELD (CO-HOST): Think about this -- this didn’t happen with Obamacare. I mean, talk about dead of night, hammered it through, they walked with the big gavel. I mean, it was ridiculous, it was absurd, and it was built on a pyramid of lies. You're going to keep your doctor. At least this is messy. And don’t think -- and people saying that he’s doing it in secret. He does nothing in secret. We know exactly what he's doing. This is the opposite -- the opposite -- of how Obamacare was rolled out. And it's messy, it's going to take time, it might be a little clumsy, but that's because they’re human beings and we are watching it. JUAN WILLIAMS (CO-HOST): But Greg, it’s been totally in secret. JESSE WATTERS (CO-HOST): Come on. Juan, you have no credibility on health care. WATTERS: You guys passed the thing in secret, it was lied about, it was expensive, you broke the website, and then it bombed. You guys have no credibility on health care. WILLIAMS: That’s not true. You are revising history. My professional life in 2009 and 2010 was an endless string of Affordable Care Act hearings aired on C-SPAN. I lived in New York at the time. It became a regular ritual to sit down in my cubicle, plug my headphones into my laptop, and listen to an entire day of Senate debate. There isn’t much C-SPAN to watch these days because the Senate is running a remarkably closed process. There are no committee hearings. There are no floor speeches defending the policy provisions of the bill. Senate Majority Leader Mitch McConnell instead has assembled an ad hoc working group to hash out the details of Obamacare repeal in private meetings. CHRIS HAYES (HOST): Have you ever seen legislation of this magnitude on this subject area undertake this trajectory, process-wise, ever? BRIAN KILMEADE (CO-HOST): Until [Sen.] Chuck Schumer sees the polls that show that the only way Democrats can be successful is start working with the president, he probably won't start working with the president. KILMEADE: Well the polls made him switch his tone already. Forty-four members of the Senate Democratic caucus have signed a letter to President Trump signaling they are open to working with him on health care — but not before he ends his effort to attack the Affordable Care Act. Trump signed an executive order that day giving federal agencies broad powers to unwind regulations created under the ACA, which is also widely known as Obamacare. There's a good chance that somewhere on Capitol Hill right now, a group of 13 Republican senators from 10 states, all white men, are drawing up a bill that could reshape health care in America for generations. The deliberations have been closely guarded and no one, including many of their GOP colleagues, can comment with any certainty on what the closed-door process will ultimately produce. For the tens of millions of people who stand to be affected by the plan, the future is increasingly uncertain. JULIE BANDERAS (HOST): Emily, hearing Nancy Pelosi saying that hundreds of thousands of people are going to die. That's before the CBO comes out and talks about exactly how many people will potentially lose their insurance, what these premiums will do to the American people. All of this information needs to come out first, before the Democrats can go and make their assessments, but yet, they are throwing the scare tactic out there.